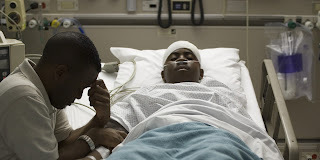 Olu looked down from six storey building, wondering about what has happened three days back that took him to the hospital where he was thinking about the whole incident. His closest friend Segun, have many things in common and do things together, in fact they dine together. There was a brilliant and beautiful young lady in their School who in every aspect was admired by every students including some male lecturer. Olu was lucky among them to have Christina as his lovely girlfriend. Segun too has interest in Christina as he always look forward for an opportunity to get Christy’s attention or any other means to seduce her, but every effort he made proved abortive. It happened one day when Olu’s parent sent message to him from the village that he should try to visit them for an important message. So Olu went to Segun’s place to inform him about his travelling preparation which will be on the third day. He implored Segun to accompany him but Segun declined and cooked up excuses in other to back his refusal. After Olu left he started thinking ways he can apply to lure Christy before Olu comes back. After some minutes he smiled and was very happy and pleased with Olu’s absence. Three days after Olu left, he went straight to Christina place in pretense demanding for a favour from her. It was actually an issue relating to a conflict he had with a colleague of his, knowing fully well that it will take a long time discussing with her; he therefore opened up and discussion ensued. “can you imagine the assault I received from John this morning” he exclaimed! The discussion lasted for hours after which Segun become very happy in his mind about his new familiarization with her, he started getting her so close without any reason to trace his very motive. Both discussed situation on campus, their study and their welfare. When Segun returned home that day, he plotted another wild move on how he could get Christina, the next day he brought a heart breaking news to her. Although he as much as possible tried to comfort her not to be weary about the incident, but then, it was not what he really had in mind, she was told that when Olu was coming back from the village he was attack by armed robbers, and he’s in the hospital for medical attention. On hearing the news she jump to her feet and started weeping, she asked him to take her to the hospital, on their way Segun told her to allow him take some money from his house in case there may be need for it. So Christy obliged not knowing it was a plot. On getting to the house, Segun cunningly asked her to enter kitchen and prepare something to take for Olu in the hospital, she quickly replied him that there was no need for food now, but Olu persuaded her and she finally agreed. She was inside the kitchen making haste to prepare the food, after a while Segun head to the doors and windows and shut them; he rushed to the kitchen and grabbed Christy from behind beyond her imagination. Like a hungry lion or like eagle that descend on it prey, then forcefully he tore her dress; all the scream and struggle she applied to escape from him went futile because Segun is quite muscular and huge. At this point, wild and monster Segun completely forgotten about the friendship between him and Olu; the suppose fiancée who happen to be his closest friend that always look out for him. Segun beat and tore her clothe, he raped her and left her with bruises, to her greatest surprise, regret and disappointment. In that condition with pains she rain all kind of curses on him. She threaten a legal action that he would for the rest of his life regret ever committing such atrocity. On the third day, which was the popular market day, the law of retributive justice caught up with him and was taken to the nearest hospital; because he fell on his way from campus and broke his ankle. Later, his situation worsen and lost his leg to partial paralysis, still, he started shaking and vomiting, in fact he can not speak nor eat anything. I imagine if Christy belong to a strong society where human being are remote (laugh), quite funny and strange, but I share that view. For her to have use something more than bare mouth to curse him is better imagine than having it in black and white. That very day Olu arrived from his journey and was told that his friend was in the hospital, straight he left for the hospital. Segun opened his eyes and saw his faithful friend beside his sick bed, he tried to speak he could not, tried to get up, he could not do that also. He closed his eyes and open it, behold some sorrowful water emerged from his eye, he wept and wept uncontrollable, he felt a great guilt in his heart, he regretted his atrocity, but it is too late to be shedding crocodile tears, it was too late for him to realize that, “there’s neither standing nor sitting for one who has swallowed a mortal”. After a week, the news of Segun’s demise broke out and on hearing it, Olu went into coma for six hours before he regain consciousness, when he open his eyes he looked around and started wandering about the whole matter. An elderly man walked in and narrated the whole incident that took place while he was away to the village and advised him to try and stop pondering on it because, the did has been done and also, whatever we human do in the secret or open place thinking nothing will happen, or no one sees or will touch him, it is just a matter of time. Whatever you sow in this life you shall surely reap, it’s what Segun sown he reaped. The man voice echoed in Olu’s ear “he reaped what he sown”. Olu watched the man walk away as he was thinking on what he said with amazement and re echoed “it is what he sown he reaped”.